A few things to know before playing. There are 52 white keys and 36 black keys, so a total of 88 keys. So you're new to piano, huh? First thing's first, you have to learn the keys. In this picture you will see one complete octave. An octave is the range of keys from one note (in this case "C") to the next same note (in this case "C" again) - lower or higher in pitch. The black keys are either called "sharp" or "flat". ***That's not really how it's written but there will be a picture for a better example. 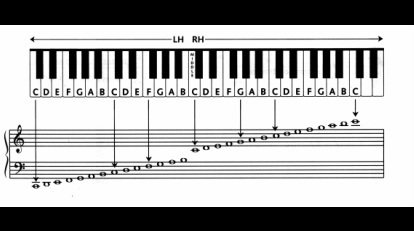 Similar to the picture above, this is the C Major Scale. This is what it looks like on sheet music. The symbol you see at the far left of the staff (the 5 horizontal lines) is called the "treble clef". The bold vertical line separating the 5 horizontal lines is called the "bar line". The solid black notes are called "quarter notes" which have 1 beat. The notes are read on this Clef differently. As you can tell, it shows you what the notes look like. Placement of the notes is where you will see it on sheet music.